As a social media expert I feel it’s my job to be the bearer of… “less than ideal for busy entrepreneurs” news. Did you know that the new trend for consistent blogging is to be blogging 2-3 times a week? With blog posts from 600-2000 words each this can be a formidable task of content production. A task I have been trying to keep up with myself, so believe ME I feel your pain! The new trend for consistent blogging is to blog 2-3 times a week? Here’s how to do it. One way I have been accomplishing this is through inviting more guest posters to my blog. This brings variety, a fresh voice, some new eyes through other people’s lists, and expands my content for my viewers to areas that I might not be as well versed. It’s a win for me and a win for my readers. Though the demand for that much writing is stressful, I will say that having all of that content at my fingertips is helpful when used the correct way. This content can be repurposed, reused and recycled on all of the other platforms on which, busy online business owners, need to be seen and heard. That’s what I’m going to focus on today: how to repurpose your content so it keeps working for you long after you’ve written it the first time. It’s time to be efficient people! If you are a business owner who can hire a team of writers – raise your hand and then get the heck outta here because this post is for all of us “one-stop-shoppers” who do it all, juggle it all, jack of all trades entrepreneurs with maybe none or one – two team members to keep it all afloat. 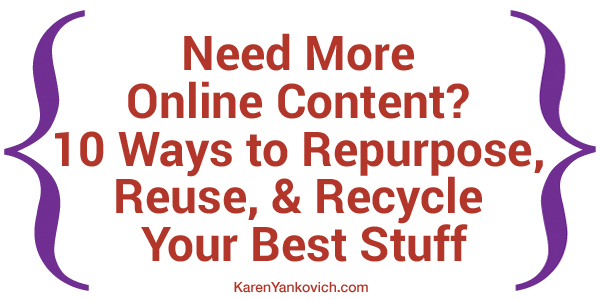 10 of my favorite ways to repurpose, reuse and recycle content you have already written. 1. Find the post you wrote that was just a list. Take each item of the list and expand them into individual social media posts each with their own image and mini “lesson”. OR use each of these items in the list as a future blog post topic. When you dive deep on an idea or topic you become more of an expert and your reader gets so much value, they will be praising your knowledge in the comment stream for sure. 2. Take a series of blog posts and turn them into a digital download. Cruise through your blog titles and look for a series of posts that complement each other well. I’m sure you have from three to a dozen on a similar topic or topics that all feed into each other. For example how many times have I talked about LinkedIn on this blog? I could take all of those and turn them into a clean downloadable product that would teach, educate, and have impact when all put together in one place for easy reading. Create a PDF with some branded graphics. Add a few transitions from post to post or “chapter to chapter” and make it into an E-Book. Make it a freebie give away to encourage opt-ins. Give it away as a bonus during a webinar. Hire someone on Fiverr to read it and upload it as a podcast. 3. Choose one of your most popular blog posts that shows you teaching an idea or concept step by step. Grab an image for each of these steps, add the text to explain each image and upload it to Slideshare. From there you can link to your Slideshare on social media and people can share it from Slideshare to their social media. Thus creating a whole new way to engage with an audience and a new market to expand into. 4. For a quick turnaround on #3, take those slides, edit them a bit and turn that into an infographic! Repost and reuse this infographic in email marketing, as a social media posts on Pinterest and Twitter, or add it to your worksheets or downloads for new customers. 5. Turn your top 5 most popular blog posts into an email auto-responder or newsletter campaign. Grab new prospect clients just after they opt-in and lead them through your best content. Don’t wait for them to find it on their own, show them! 6. Syndicate your best blog posts onto popular sites that allow you to repost your stuff as-is. No need to re-write or re-format anything, just copy and paste your post into a new home. 7. Take your best blog post and turn it into a series of questions. Post these in LinkedIn groups to promote discussion, grab some market research, and see who engages and why. You might find a few new ideas to explore or a few new prospect clients to reach out to! 8. Turn your Slideshare, or your series of posts, into a video and post on YouTube. Since YouTube and Google are fast friends you will gain some status in search results and potentially nab another large audience who likes to take in content in a different way. 10. Go back to the beginning. Did you start your blog or social media threads years ago? Go back and see what you wrote about when you first started. I’m sure it was important to your business why, but did you explain each topic as well as you could now? Have you learned a few more tricks and tips of your trade that you could add? Take one of those old posts and either re-write it completely and re-post it, OR add an addendum and talk about all the new insights you have gained since you started. People love to see growth, and when you show them that you have grown and changed with the times they trust you as more of an expert in the your field. So whatcha gonna try first busy business owner? Keep this list handy, and every time you feel stuck for something new, just pull this post out and repurpose, reuse, or recycle something you already have just waiting to be used! Wondering the best way to engage in LinkedIn groups? Need help deciding how exactly to recycle your favorite content? Join me in my LinkedIn Group and ask! Myself and others who are in your exact same boat are there to help you through to find the perfect answer for you. Karen – thanks for the top notch reminders on how to re-purpose what we already have. I’ve done some and will consider others now. Great! Happy to be of help. Another way would be to quote yourself. Take a nifty phrase, add a picture, and post it to all your favorite social sites. Great idea MaryAnn! Thanks for sharing! Outstanding and concise, value added information, all in one place! Great road map to follow. You continue to contribute to my success. So nice to hear Joyce! Let me know how it goes.